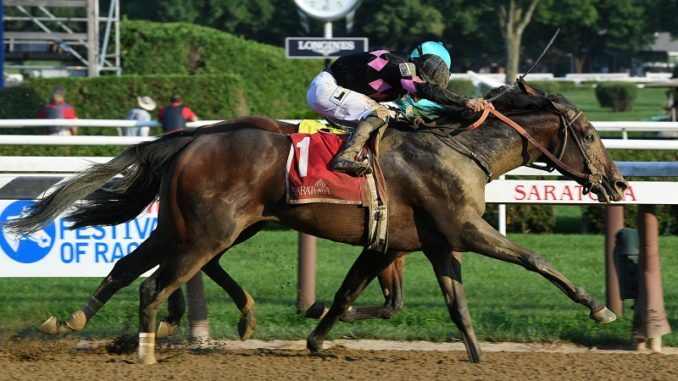 Haynesfield gelding got up at the wire to win Aug. 5 at Saratoga. Although the Alydar is slated as a $100,000 stakes at Saratoga Race Course, the Aug. 5 field of five all had one thing in common—they had each made at least one start in grade/group 1 company. However, the top-level contender most people are familiar with is not the one who won, as Eric Dattner, Barclay Tagg, and Harry Astarita’s Realm rallied from near last to outrun Chilean group 1 winner Kurilov.The 5-year-old Haynesfield gelding came into the race off a score in allowance/optional-claiming company at Belmont Park, but before that Realm had not won since November 2016 when he took an allowance. That win was followed by a third-place effort in the Cigar Mile Handicap (G1). Trained by Tagg, Realm broke smoothly from the inside post in the Alydar and was able to settle just behind Outplay, who set fractions of :24.32, :47.96, and 1:11.89 through six furlongs. While Kurilov and Timeline began to pressure the leader at the top of the turn, jockey Junior Alvarado was content to let them pass Realm, who was suddenly second to last with fan favorite and classic contender Patch trailing the field. Rounding the turn, Kurilov made a strong move to take the lead, which he held into the stretch. However, both Realm and Patch rallied from the back, with Realm barely getting to the wire for the score by a head. Final time for the 1 1/8 miles was 1:50.02 on the fast main track. The winner paid $27.20, $9.90, and $3.90, and Kurilov returned $3.60 and $2.70. Patch got up for third to pay $2.70, and Timeline and Outplay completed the order of finish. “Actually, the last time I worked him, I told Barclay … if it’s time to take a shot in a stakes race, that would be now because he’s at the top of his game,” Alvarado said after the race.